Getting ready for an open studios event in a new studio in a building newly converted into studios. Having helped sometimes with activities at Northern Print for Ouseburn Open Studios – and having been a volunteer with organisations who put up displays about the area’s buildings or environment in a corridor of studios during such events – this is not my first experience of being on the studio side of such events. 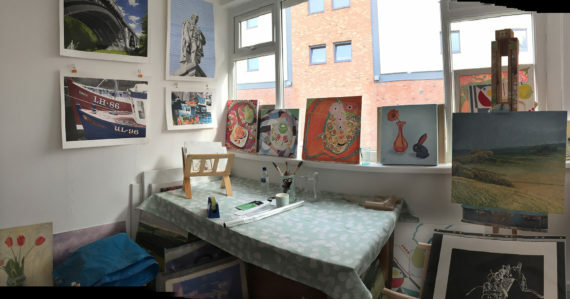 It is, however, my first time of taking part in my own studio (shared with my friend, Claire Hakin) – and it’s the first time the studios I’m in have taken part. People seem to be still in the process of moving into the studios. We were among the earlier ones to sign a lease and had to wait for the builders to finish off the fitting out before we could move in. The building is a former industrial building that used to be a welding place but had stood empty for so many years that I don’t remember ever seeing it being used before. It didn’t even look like a building that had potential for reuse and I’d expected that it could be knocked down and replaced. It’s amazing what some repairs, new double-glazed windows, new internal walls and doors, central heating – and a lot of white paint – does to transform a building. It’s turned into a desirable place to have workspace in a useful location. Before I’d even had time to splash the merest spot of paint onto the floor or wall, we had to decide if we would open for the spring open studios. We found that there were at least 4 or 5 studios willing to open and the possibility that more might move in before that weekend. We checked with the manager of the building that it would be ok. By then, we had 6 studios willing to open, and at least 10 artists and designers taking part. Because we were too late to be included in the official promotion of the event, we had to consider what we could do for ourselves to promote our first opening within a very short time and with zero budget. A few of us set up social media accounts and a very basic website, consulted with whoever we knew had moved into the building, and started to promote our first opening. We have used our personal accounts to promote our studios’ accounts. 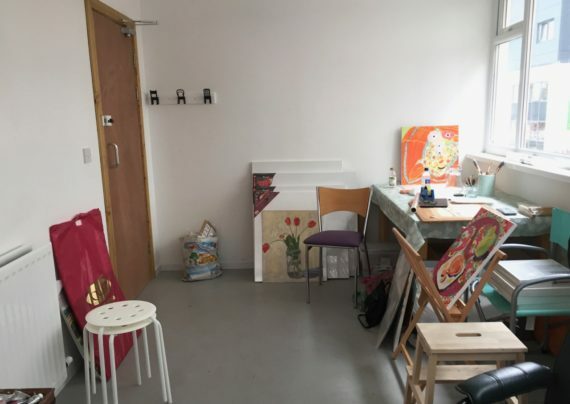 We have mentioned other studios in the area who participate in Ouseburn Open Studios and they have kindly shared our posts. The charity involved with the area, Ouseburn Trust, has helped to spread word and printed out some simple small black and white posters/flyers on their laser printer at a very modest cost. Those small posters have gone into very local places so people visiting open studios on the Saturday might see us. We have put some work in the windows of our individual studios to pique the interest of passing people. We have told our friends and family about it. This week, I heard that the artists at the studio up the road had made a last-minute decision to open theirs on the Saturday so we have been helping each other to spread word on social media. One of our challenges is getting people to see where we are located and to realise we’re in convenient places. As I write, I have no idea if visitors will turn up on Sunday. If they do, what we have done will have proved a successful approach. We’ll know we can do more later in the year with more participants and time to be included officially. *But it would be lovely to see some people on Sunday too! We’re in B.Box Studios, Stoddart Street, Newcastle upon Tyne – next to the Biscuit Factory. My friend and studio mate Claire were due to open our studio for the first time on Sunday 24th March 2019. It was our studios’ very first open studios event. The building has been standing empty for some years before being converted to studios so even people who know the area quite well were probably unaware that people had started to move in and work in there. We had moved in too late to be included in the official Ouseburn Open Studios publicity and I was concerned that people would be unaware that we existed and wouldn’t even be looking for an open door into our building. The efforts put in by those of us taking part (plus some of the studio occupants not ready yet to open) to tell people about our opening worked. It was a slow start (but that gave studio occupants the opportunity to visit each other’s studios – a rather rare chance during open studios). Outside visitors started to appear around midday. People took their time to look at our work. A couple of people made a return visit. This seemed positive. One couple mentioned that they visited because they saw a flyer in the Biscuit Factory’s café while having breakfast there so we know flyers in local eating places are worth doing. Sadly, after all the effort of promoting the event and planning what would go in my space, I couldn’t be there myself. Lifting fairly heavy piles of prints when searching for the prints I wanted to take into the studio on Saturday morning, I had triggered a bad flare up of rheumatoid arthritis in my shoulder, and to a lesser extent in my hands. I was grateful to Claire and her husband for looking after the studio that day and sending me reports of what people were viewing. I was also glad to get reports from friends who visited. We can be more prepared for the next event. This time we were starting from scratch, including finding out who was in the studios and setting up social media accounts. Now some people know where we are and what sort of things they might see so we can build on that for the next event. A final thought occurred to me as I went to sleep: ‘I must get a clicker.’ Years of working in public culture means I need to establish baseline figures against which to measure if we’re succeeding in getting people through the door.